Just a quick post to share two newsworthy items. First, the Harvard School for Public Health released a new online calculator to estimate your risk of cardiovascular disease. I like that it focuses on lifestyle choices and modifiable risks. It's easy to complete and you don't need to know your blood pressure or cholesterol to get your results. Despite being one of the leading causes of mortality and morbidity in the U.S. and worldwide, people seem to be less fearful of cardiovascular disease than cancer or Ebola. And, unlike some diseases almost all cardiovascular disease is preventable. The recommendations you receive after completing the survey include practical tips for improving your health. It's been so popular that the site sometimes gets overwhelmed (an encouraging sign), but keep trying. It's worth doing! "People who frequently cook meals at home eat healthier and consume fewer calories than those who cook less, according to new research. The findings also suggest that those who frequently cooked at home -- six-to-seven nights a week -- also consumed fewer calories on the occasions when they ate out." Certainly, not surprising, but it does confirm again that we're on the right track in planning a series of cooking classes for ASHA staff. One final post about the the Mediterranean Diet and Workplace Health Conference at the Harvard School of Public Health. The conference organizers prepared the review paper below. It clearly indicates the health benefits of following a Mediterranean diet and the evidence that supports the recommendation. I particularly like this chart at the top of page three that provides clear instruction for following a Mediterranean diet. Please take a few minutes to peruse the paper. When I announced that ASHA will be self-insuring the medical coverage for staff next year, I mentioned that one of the advantages is that we have more flexibility in the plan design. This has allowed us to enhance benefits in a number of areas. Below is a summary of the changes our plan participants should expect for 2015. 1. You’ll receive a new card. 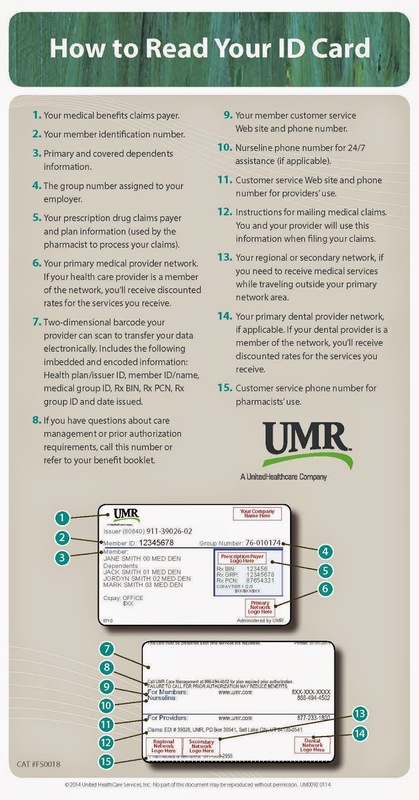 Our administrator will be listed as UMR, but we’ll be using the same Choice networks through UnitedHealthcare that we have now. Your id number, the mailing addresses, phone numbers, and the website will all be new. We’re doing everything we can to assure you will have your new cards in hand before January 1, 2015. And, we will make sure you have all the up-to-date contact information for the 2015 calendar year. 2. To get a 90 day supply of a prescription medication, you will have to use mail order. Through mail order, you will receive 90 days of medication for two copays. (The cost of procuring the medication through mail order is less, so we’re passing along some of that cost savings to you if you chose this option.) If you chose to have your prescriptions filled at your local pharmacy, you will get a 30 day supply for one copay. Our copays will continue to be $10 for a generic (Level 1), $35 for a preferred brand name (Level 2) and $60 for a non-preferred brand name (Level 3.) If you are in the Choice Plus with HSA plan, you will continue to pay the cost of the medication until you hit your deductible. Then, the copays will apply. All mail order prescriptions will be transferred from 2014. You will have to call OptumRX the first time you need a refill in 2015. After a prescription has been filled once, you’ll be able to order refills online at the UMR site. Your prescription number will stay the same. At a local pharmacy, you’ll just need to present your new insurance card. If you have a specialty medication, call and talk with your advocate. You’ll just need to provide your new id number and your prescription will be transferred. Some of the tiers that drugs are in may change. The 2015 prescription drug list has been posted on the Healthcare Savvy ASHAnet site for you. Diabetic supplies will now be covered at the generic copay level of $10. Learn more about prescription drug pricing and safety by reading the summary of the session we hosted here in July. 3. Out-of-network services will be reimbursed at 90% of UCR (usual customary and reasonable) in 2015 instead of 80% as they are now. This enhances the benefit for staff that seek services outside the network. 4. The in and out-of-network deductibles in the Choice Plus with HSA will now cross accumulate. This means that whatever you spend out-of-pocket for in-network services will also count towards your deductible for out-of-network services. This softens the hit of the out-of-network deductible. 6. Chiropractic services will no longer be limited to 30 visits per calendar year. They will be reviewed for medical necessity after 25 visits and an unlimited number of visits may be approved if they’re medically necessary. 7. Replacement batteries on durable medical equipment will be covered in 2015 enhancing your coverage. 8. A number of exclusions for mental health disorders have been eliminated for 2015 enhancing your coverage. We will talk about these changes during our open enrollment meetings. The HR team will also be happy to answer your questions.